are stock tubes a standard size? 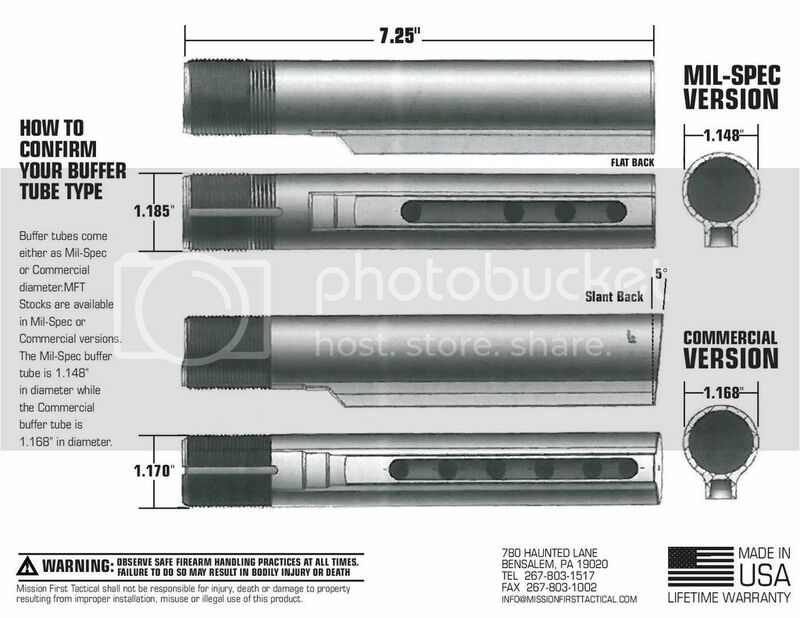 probably a silly question but are m4 stock tubes all much of a muchness? if i wanted to replace a stock can i just buy one and slide it on? or will i be looking at getting a whole new assembly? They are generally all very similar, however this is where the fun begins. Everyone has different experiences. In the real world you have Mil-Spec and Commercial versions, however in the Airsoft world we seem to have a mix. Some stock tubes I've measured are spot on the standard but some are in-between. Same I've found with actual stocks. It's just as difficult identifying which type of tube a stock was designed for (when its not stated) as figuring which stock you have on a gun, at least with the gun in your hands you can use simple geometry to measure the diameter of the tube. Based on my research, while there are some odd ducks out there, it is quite clear that there is an established "airsoft" spec which does not match either of the above. The vast majority of buffer tubes on airsoft ARs are mil-spec or smaller, the spec that TM originally came up with back in the day with slightly narrower than mil and that's become the standard. Same story with the stocks themselves. I lost count of the number of different collapsible stocks I've tried and how many brands I've tried them on years ago. I've had some that were very tight, quite a few that are wobbly, but nothing that ever didn't fit at all. GBBR's tubes are very different. There are big variances in AEG tubes' inner diameters and smaller variances in outer diameters. The notches on the bottom can also vary quite a lot. GBBR's tubes are very different. Which brands? I know that WA/G&P, GHK, WE and KWA all work to basically the same spec and will all take mil-spec stocks. WE, G&P (and possibly GHK and others) are all actually threaded the same and will accept RS mil-spec buffer tubes. I meant, compared to AEG tubes.